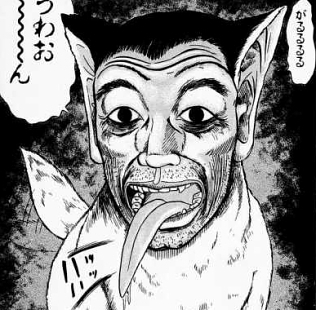 Animals with human-like faces have long been rumored to exist in Japan. In recent decades, countless people have reportedly encountered human-faced dogs (jinmenken) around town and on the highway. The modern-day explosion of alleged human-faced dog encounters began in the late 1980s and early 1990s. According to numerous stories, human-faced dogs are most frequently seen at night, usually by people taking out the trash. At first glance, the creature may look like an ordinary stray dog rummaging through the garbage, but closer inspection reveals a face that looks human. Many stories claim the human-faced dog speaks when confronted. In a weary voice, it most often says, "Leave me alone." Other human-faced dog encounters allegedly take place on the highway. The creature can reportedly run at speeds of over 100 kilometers per hour (60 mph). It is said that any vehicle passed by a speeding human-faced dog on the highway will have a terrible accident. Numerous theories claim to explain the origins of the human-faced dog. Some suggest the creatures may be experimental human-animal hybrids that have escaped from a biotech lab. Others claim they are mutants spawned by environmental pollution. And while some people suspect the creatures may be the spirits of people who have died in traffic accidents, others speculate that they are ordinary dogs possessed by the restless ghosts of office workers who have taken their own lives after being laid off (the dogs usually have the face of a middle-aged man). Still others believe that human-faced dogs are spiritual beings, and only people with the ability to sense the supernatural can see them. Whatever the explanation, it is probably best to keep away -- it is said that anyone bitten by a human-faced dog will turn into one. The oldest known stories of human-faced dogs in Japan can be traced at least as far back as the Edo period (1603 to 1868). 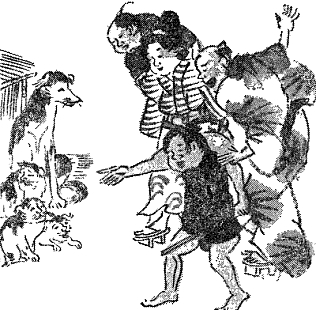 According to the Gaidan Bunbun Shuyo -- a book by 19th-century historian Ishizuka Hokaishi that chronicles events from 1804 to 1830 -- a human-faced dog was born in the Tado-machi area of Edo (present-day Tokyo) in June 1810. After learning of the strange creature, a carnival sideshow manager acquired it and featured it in his show, where it proved to be a popular attraction. In those days, a superstition claimed that syphilis patients could cure themselves by fornicating with canines. This human-faced dog was rumored to be the offspring of such a union. Am I alone in saying that is THE most convincing video I've ever seen? Navarr is funny, the others that replied, not so much. Is anyone really going to believe it? I believe I've seen something similar to this, it's not a dog, it was like a hybrid of cyclops and macaque, I even got it photographed by my cousin. But thanks to photoshop, everytime I show the pic to people they laugh at me and compliment my photoshop technique, while it's not that what I want. As technology develops (especially picture editing), less and less people will care about such a thing. Eventually these thing will be categorized as the thing nobody give a damn about. Even when you have photographic proofs. And did you see the picture on the top left above? It's a photoshop, the human face was taken from a racist person in the internet. You can google it if you want to prove it. What is a 'Photo-shop' is that also a Japanese hybrid monster thing? I am scared now, will this 'Phootoo' thing get me whilst I sleep? Interesting. I've been here awhile, but never heard of this superstition. I don't think we have anything similar to this one in the West, do we? As the intro sentence said, human-faced animals have been around for a while. In the 80s and early 90s there was a huge buzz around jinmengyo - human faced goldfish - supposed to live in a pond in Shizuoka. The stories never seem to talk much about the condition of the person who witness these beings. Were they tired / short sighted /on medications? haha! yeah they may be trippy. From an early age I was obsessed with that human-faced dog from Body Snatchers (but had no idea about these Japanese stories). I recently watched the movie for the first time since I was a kid, and was happy to discover that the human face is supposed to be Jerry Garcia's! He plays the homeless banjo player, and there's a brief scene showing how a pod is mistakenly merging him with the dog. 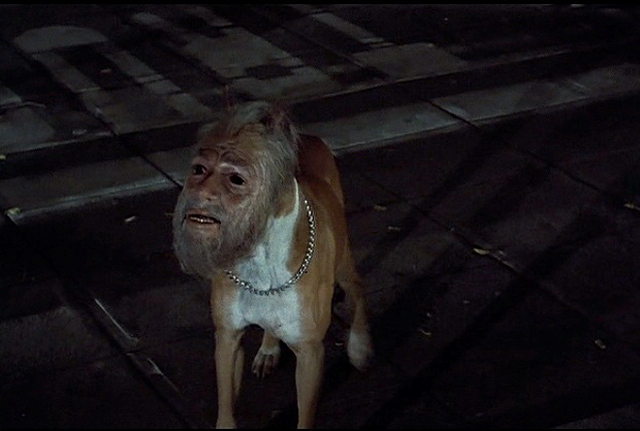 On the commentary Philip Kaufman reveals the groundbreaking special effect: it's a dog in a mask. Am I the only one wondering about that last paragraph? How does that kind of remedy become common knowledge- a practical joke on people desperate to cure the STD? this is so stupid that makes it funny!! Ganz herzlichen Dank für den Artikel! Ich betrachte deinen Blog echt gern und bin an Tieren, folglich an knuffigen Katzileins und Hundis interessiert. Was ich echt nicht begreifen kann, ist die Verhaltensweise mancher Tierhalter! Echt viele betreuen Ihre Tiere im Haus wirklich nicht so, wie man es müsste! Thema Futter und Platzangebot! Hunde und Katzis sollten anständig und lieb behandelt werden - oder man sollte eher keine Tiere halten! Allerdings ok, genug geärgert hehe Wünsch echt viel Spaß beim Knuddeln eurer Tiere! Hi, everyone how reads this. I´m from México, and here there are a lot of stories alike this, in fact, a good friend of mine, sometime told me that when he was 9 years old, during the summer vacations in a very rural town, he and others kids play in the solitary classrooms. There wasn`t janitor or security guards. So they destroyed a lot of chairs, windows, books. A nigth that was almost midnigth they were at the street and bored. They want to do the same that usually do in dayligth hours and entered into the empty school, one of the kids realized that something in shadows was staring them and gone to check it out, since was maybe some animal (a lot of mexicans are very cruel with animals) to trought it rocks with a slinger. He shooted and the shadow cries, as an human, and gone after the kid. He begun to run, yelling and all the other kids also run, a dog was chasing them, screamming profanities with human voice. Eduardo, my friend saw it in close range and that dog had the face of and old man. It chased them until a bridge above a river and stopped there. Stories as this are heared even now in several towns and from several kind of people. But here we have not any clue of where they come from. Also there are stories about women with donkey face, but they are other kind of entities, and shows to an specific kind of men. I apologize with you about my poor and limited english, I´m still learning it. Please comment. i am commenting like you requested. How can a dog say "Leave me alone" When a dogs jaw is not adapted to speak english yet anyway and also its mouth is not adapted to say the easiest of words. There was one dog that could say sosage and as i qoate the person that taught that said it took serveral years since dogs live 10-20 years i think its hard to teach a dog to say "Leave me alone" as 3x7 is 21 i know that and i aint good at maths because im 13. But it had a human face/head so it can speak human language. I think you're basing from the first two pics which are clearly photoshopped. The last part was disturbing. I think the syphilis patients are tricked into fornicating with dogs. You know just to add insult to their promiscuity. In my time as an executive at a utility company in North Carolina, we actually hired a couple of stenographers whose faces closely resembled those of dogs. We were never quite sure if they were some sort of strange hybrid or if they were just really, really ugly. That was sooooo fake. You can clearly see the photos are photo shopped. The "Human-dog" that popped out out the bush was an animation. Who would waste their time doing this? 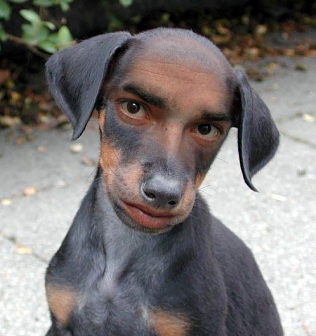 I found this site by googling "human-faced dog." I live in the American Midwest. In the early 1980s, I saw a creature I initially thought was a dog in my neighbor's backyard. It was walking slowly towards me and my cat. As it got closer,I realized the face looked like...well, I'm embarrassed to say it, but...it looked like a bearded man. It was also a large head. 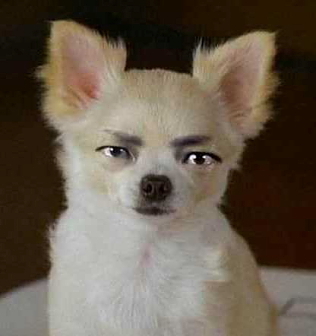 It was walking towards me and I muttered to myself, "go...away.." and the...dog (?) immediately turned around and walked away. I looked down for my cat, picked him up, and looked back to where the dog (?) was; it was nowhere to be seen. I told my husband about it and he laughed at me, so I never brought it up again to anyone. I've thought about it now and then over the years, however, and decided to google it. Not having any explanation for it, I can only assume it was a dog that had a deformity from an accident, but I still wonder and every time I think about it, I have the creepy-crawlies. I'm intelligent, sane, and do not drink or do drugs. I will never forget that. Anyway, your site is interesiting. Thanks. Since this was posted almost six years ago, I probably can't hope for a reply, but going to try anyway. Would you be willing to say where in the Midwest this happened? Do you know of anyone else who saw it or have you heard stories about it? Gabrielle, it scares me. When ever I think about the event, it is hard to tell how it happened or if it happened. But other times I am positive that I happened. Wow thts crzy! Were was thy seen? Omg! All I'm saying is the American equivalent is Bigfoot - in regards to human-esque creatures who are shy and only spotted sporadically.